The AAII weekly survey came in with the bulls at 34.9% - basically unchanged from last week. The ranks of AAII members who are pessimistic about the market fell by 5.7% points to 29.5%. Those either confused or ambivalent about the market were the majority at 35.6%. This was in fact the highest level for the “Neutral” choice since early 2006. I’m not sure exactly what this means going forward but it seems that a lot of the members of the American Association of Individual Investors don’t hold strong views about the market either way. Perhaps it is difficult to care about the stock market because they want to have little “skin” in the game (for the mutual fund flow information see below). 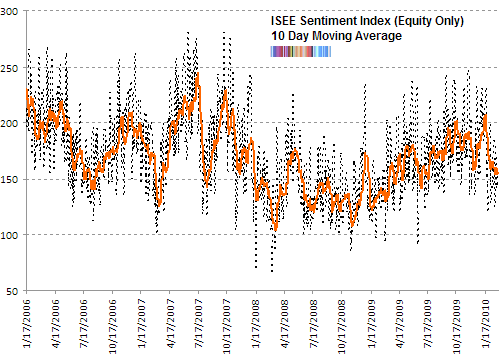 While Investors Intelligence’s weekly survey of newsletter editors’ sentiment doesn’t have a “neutral” option, it was just a few weeks ago that the third option (”Correction”) was the highest one: see Sentiment Overview for February 12th 2010. At the time, ChartCraft interpreted this rare event to mean, in contrary fashion, that since many are expecting an imminent correction, we don’t see one. This week’s II survey results see the “Correction” camp shrink from the multi-decade high of 39.7% to 35.6%. The bulls now take the lead with 41.1% and the bears trail with just 23.3%. To put this in perspective, it is higher than the Bull/Bear low we saw at the start of this month but it is not as high as we saw in January. So middle of the road, basically - and unfortunately, without much edge. This week the Conference Board’s Consumer Confidence survey showed a deterioration with a drop of 10.5% - from 56.5% to 46%. For an in depth look at this indicator and what it means going forward, please see: When Consumer Confidence Drops, The S&P 500 Rises. While it may be perverse to think of the difficulties of everyday American public as a catalyst for higher stock market prices, this is what history suggests. According to the latest Bank of America Merrill Lynch survey, large institutional investors around the world have retreated into a defensive posture. Hedge funds have reduced leverage from 1.33 to 1.00 and increased cash levels to 4.0% from 3.4% (compared to January 2010). As a region, European sentiment was especially hard hit with most avoiding the region and reducing holdings of European banks. Cash is king (with the US dollar a big crowd favorite) with 12% of global asset allocators overweight it compared to 8% last month. This is the highest cash holdings since June 2009. Banks are the least loved sector (with an underweight as much as March 2009!) with the industrials, technology and energy sectors being favorites. Other than Europe, global investors are worried about China’s economy. Only 7% expect it to grow in the next 12 months - a big drop from January when 51% expected it to do so. Not surprisingly, there has been a retreat from commodities. In February only 10% of respondents were overweight commodities compared to 23% last month. This week Market Vane’s Bullish sentiment has tip-toed up to 53%. During the recent correction it fell slightly to 50% (2 weeks ago). But at this rate it won’t be long before it has creeped up to 57% where we last found it in early January 2010. And even more frightening, at the bear market top in October 2007. Obviously we’re not there but I’m keeping an eye on this indicator. The weekly survey from the National Association of Active Investment Managers continues to show a recovery in bullishness. The latest results were 44.55%, 8% points higher from last week. For a long term chart of this relatively new and unkown sentiment indicator, check out last week’s sentiment overview. The ISE is showing some concern from retail option traders but not enough to move the indicator to a significantly low level. At the current reading, for the past 10 trading days the average retail traders is buying 155 calls for every 100 puts. That’s significantly lower than just a month ago when it was at 207 calls for every 100 puts but it isn’t enough to show real fear. If we happen to see the ISE ratio drop to the low 100’s then I’d be satisfied, from a contrarian view, that there has been capitulation. We are now smack dab in the middle of nowhere. Neither fear nor complacency. Stepping back form the medium term perspective, from a daily perspective, the CBOE (equity only) put call ratio did show a surprising amount of fear on Thursday when the S&P 500 dropped to an intraday low of 1086.02 and recovered to form a picture perfect hammer candlestick. 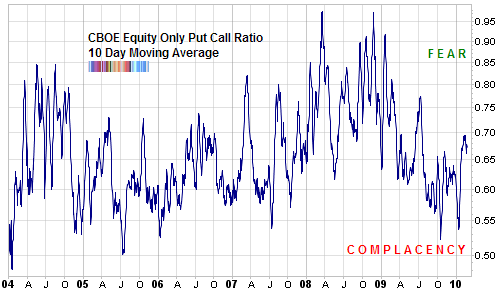 The put call ratio hit 0.81 on Thursday. To find a higher level of concern we’d have to go back to early October 2009 when the S&P 500 was trading at 1030 and rebounded sharply higher to 1100 in the next few weeks. The CBOE volatilty index (VIX) is suddenly back at 20. To find a lower number we’d have to go back to mid-January 2010 or May 2008. Both were previous high watermarks on the S&P 500 index. But I want to be really careful about this because I have not been shown a persuasive historical pattern where lower volatility levels corresponds to a fall in the stock market. There is very strong evidence of the opposite, that is, extreme highs in volatility being contrarian bullish but not necessarily the other way around. According to the latest ICI mutual funds data US retail investors are continuing the exodus to fixed income. The past week had an inflow of $4 billion more to bond funds and in comparison, an embarrassing $14 million inflow to US domestic equity funds. The week prior to that saw an outflow of $4.8 billion from equities. 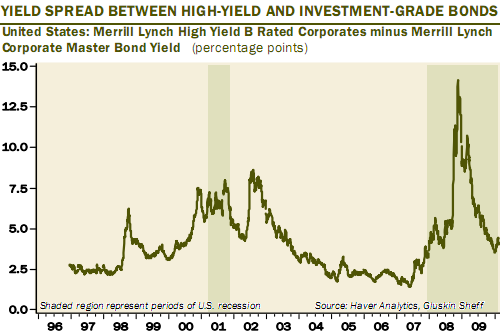 The current reading is 415 basis points and normally, during the good times it hovers around 200-400 basis points. A thorough compilation for me to digest with my English muffin, and clear as my cup of mud.